Korean inspectors said components of a seat heater didn't meet safety standards. Toyota Motor Corp. is expected to ask federal regulators to excuse a fire-safety lapse in its vehicle seat-heater system that prompted the automaker to halt sales of several 2013 and 2014 models last week. Toyota ordered its North American dealers to stop selling the vehicles after being alerted by South Korean safety officials that components of the seat-heater system didn't meet fire-retardance standards also used in the United States. The order covers about 36,000 vehicles in U.S. dealer stocks, according to a memo distributed to dealers and obtained by Automotive News. Toyota said some vehicles in transit to dealerships also may be affected. Toyota spokesman John Hanson said the company informed the National Highway Traffic Safety Administration of the issue but doesn't feel it should have to recall cars that have been sold. No accidents, fires or injuries related to the issue have been reported in North America, he said. "We don't believe that it is a defect issue or a safety-related issue because there has been no occurrence of any problems out in the real world," Hanson said. Automakers routinely petition NHTSA to excuse them for a minor deviation from U.S. standards that they feel has little or no effect on safety -- what the agency calls "inconsequential noncompliance" -- rather than seeking a recall. Last spring, for example, the agency excused Ford Motor Co. for selling cars with a government-mandated window glazing symbol on the top of the windshield rather than the bottom, sparing Ford from having to replace windshields on more than 19,000 vehicles. NHTSA said in a statement last week that it was expecting such a petition from Toyota and will monitor the risk associated with the noncompliance. Hanson said he didn't know the timeline for the agency's decision or the total number of affected vehicles that have been sold. 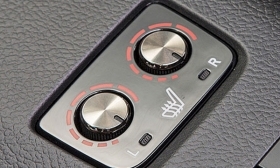 The affected models -- the 2013 and 2014 Toyota Camry sedan and hybrid, Avalon sedan and hybrid, Corolla compact, Sienna minivan, and Tundra and Tacoma pickups -- include some of the company's top sellers, but only about 8 percent of 2013-14 Toyota vehicles in the United States have heated seats, according to Kelley Blue Book. Hanson said the seat heaters in question were produced after August 2012, when the fabric supplier was changed; he declined to name the supplier. He said dealers have been told to stop the vehicles until the part can be replaced.